Update June 2017: Now with a new and fully working adsl line! The internet is now finally consistent, also good for those that need to work while here. Have you ever dreamt to spend your holidays in the Tuscan country-side in a romantic, cosy house on a river? Your dream has come true! Casa Carlotta is an old house, a mill, completely restored, preserving its original image with a warm and cosy atmosphere where the old and the new perfectly meet. It is the ideal place to spend both a relaxing and cultural holiday. Casa Carlotta is a two-storey house: on the ground floor there is a living-room with a fireplace, a dining room, a kitchen (equipped with all the modern comforts) a toilet and another smaller living-room, in addition to a terrace where it is possible to relax. There is also a garden equipped with tables, chairs and check-chairs where guests can have their meals or relax surrounded by the Tuscan countryside. On the first floor there are two double bedrooms with private bathroom and shower and a living-room/studio with a sofa-bed. Guests can enjoy a private terrace overlooking a river, a paradise for reading and relax. The outdoor area also features a barbecue grill and a dining table to enjoy the outdoors while cooking a typical Tuscan product on the grill. The house has a music system with a wide classical music collection. The house has a new wifi system - now fully working. As per beds, you can count on two bedrooms with double beds, another room (studio) with a french bed (in between a double and a single) and a sofa bed in the second living room (which can work as a forth bedroom), for a total of 7 places. In addition we also have one baby cot for guests use (if needed). The house is extremely fresh even during summer months (it is not unusual to sleep with a blanket even during August). The house is situated in an old, quiet village called Ponte agli Stolli, in the famous area of Chianti Classico (10 km from Greve), a strategic point to reach the most famous Tuscan cities such as Firenze, Siena and Arezzo. It is the ideal place to spend both a relaxing and cultural holiday. The house is in the middle of nature, surrounded by vineyards and olive trees. The site is of untouched nature, very panoramic/romantic and charming. Walking distance to the house (200 meters) there are a grocery shops, a bar and a restaurant/pizzeria (extremely good and value for money, only open on saturdays and sundays). The house is very close to Greve in Chianti (around 10 Km, around 10\15 minutes), Florence (35 minutes by train or car), Arezzo (40 minutes by train or car), Siena and San Gimignano (1 hr by car). Nearby the house there are horse riding facilities (1km) and a swimming pool (1km). The house overlook a small river that forms some natural pools where (in the right conditions) it is possible to swim. The neighborhoods offer wonderful walking itineraries and wine tasting experiences. There are some nice market places close to the house: Greve, Panzano, Arezzo with its antiques market. Upon request, we can arrange cooking lessons with an English speaking cook who will teach you to prepare a delicious Tuscan lunch or dinner. The prices include taxes, bed-linen, towels, the consumption of water, gas and power and final cleaning. Expenses for heating will be charged separately (on consumption - to be paid at check-out - no overcharge applied). At arrival we ask for a deposit of €200 against possible damages and/or losses. This deposit will be refunded at departure, expenses caused by damages or losses may be deducted. The house overlook a small river where it is possible to swim (no danger). Nearby the house there are horse riding facilities (1km) and a swimming pool (1km). beautiful old house that has been tastefully renovated. 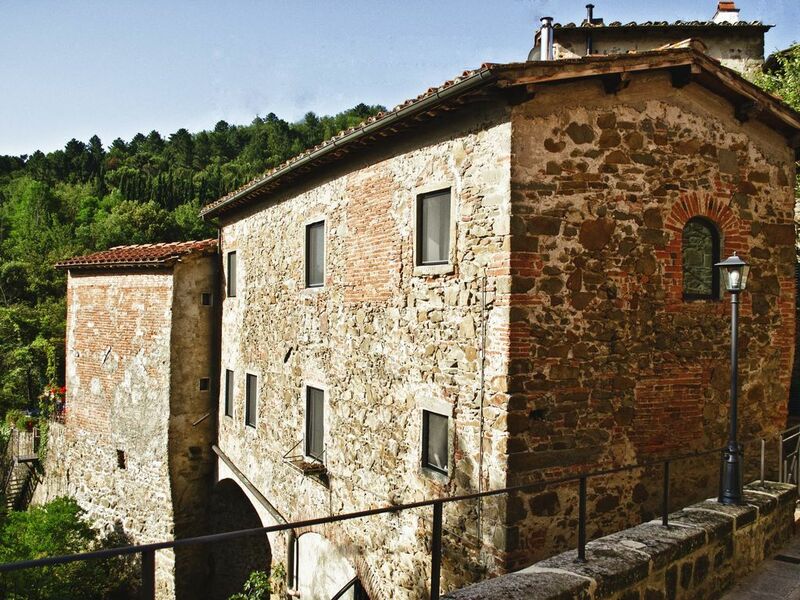 Perfect for discovering Tuscany with its beautiful cities (close by are Florence and Arezzo). We very much enjoyed swimming in the river very day, either just below the property or a walk down the road. The bedding was comfortable and the kitchen very well equipped. The bedrooms were cool at night (July). We also loved the village shop and the shop-owner who was extremely helpful, from giving us tiramisu recipes to buying dish washer tablets in for us (so we never had to go elsewhere for our shopping). The pizzeria in Ponte Agli Stolli is extremely good value (with delicious funghi pizza and pasta) and in high demand, so booking is recommended during high season. We only discovered on the last day that there is a bar next to the pizzeria. Also the house owner Luca was extremely helpful by email. Thanks so much Luca! Lovely, peaceful and well located for our needs. We are two couples celebrating our wedding anniversaries. We used Casa Carlotta as a jumping off point for day trips throughout Tuscany and were pleased to return each night to a cozy place where we could discuss our collective experiences. Comfortable beds, quaint decor, pleasant outdoor seating for wine tasting and chatting. We couldn't ask for more. This was a great place to stay in all regards. Charmingly decorated with home touches throughout, my wife and two daughters had a great stay here. A well equipped kitchen made it easy to have breakfast and dinner if we wanted to. Very strong internet signal. Close to the Chianti region and many wineries and close to Florence where we went twice. The beach area at Viareggio was totally different than any other area we saw in Tuscany. Lucca is also great to visit. Thanks to Luca and Laura for welcoming us to their home. A great base from which to explore the area - and also perfect for staying 'at home' and relaxing. We felt as if we were in a very rural area - but had easy access to the local shop - and short drive to town / facilities and more major roads. The house is situated in an old, quiet village called Ponte agli Stolli, in the famous area of Chianti Classico (10 km from Greve), a strategic point to reach the most famous Tuscan cities such as Firenze, Siena and Arezzo. It is the ideal place to spend both a relaxing and cultural holiday. The neighborhoods offer wonderful walking itineraries to those who feel the need of leaving aside the frenzy of modern life and of plunging into a dimension out of space and time, characterized by an harmonious relation between Man and Nature, the same that has inspired many famous artists who have lived or visited Tuscany. All prices are for up to 4 people. For 5 and 6 people please add 15 euro per extra person per day. The prices include taxes, bed-linen, towels, the consumption of water, gas and power. Final cleaning not included (€50). Expenses for heating will be charged separately (on consumption). At arrival we ask for a deposit of €150 against possible damages and/or losses. This deposit will be refunded at departure, expenses caused by damages or losses may be deducted.